El boletín se convierten utilizando Google Translate. Entendemos que esto no es una traducción perfecta, sin embargo, esperamos que sea útil para las familias de que hablan español. Si tiene alguna pregunta sobre la información, póngase en contacto con nosotros. This translation is provided by Google Translate and opens in Spanish, but can be used for other languages. We understand that Google Translate is not a perfect translation. Please contact us if you have any questions. KSPTA Grant Application - due October 9, 2018 at 4 p.m.
Offering $20,000.00 total for the 2018-2019 school year to fund innovative educational ideas. Bacich Safe Routes to School will provide coffee (for adults) and muffins in the quad. Kent walkers, bikers, skateboarders, and scooter riders will get a small prize and enter a raffle to win a backpack! Visit the Safe Routes to School page for your neighborhood or "park and walk" route. Don't miss the first speaker, David Riedel - Owner, Riedel Research Group, U.S.-China Relations: Past, Present, and Future on October 18, 2018, from 7-9 p.m.
Kent Intake Conferences, Online portal to schedule intake conferences at conferences.kentfieldschools.org. KSPTA Grant applications due at 4 p.m.
Wednesday, October 24, 2018: 5th/6th Principal Chat, 8:45-9:45 a.m.
7th/8th Principal Chat, 8:45-9:45 a.m. This week I was fortunate enough to attend a presentation by one of the founders of Sandy Hook Promise, a non-partisan national nonprofit formed and led by several family members whose loved ones were killed at Sandy Hook Elementary School almost six years ago. The sole purpose of Sandy Hook Promise is to prevent gun violence before it happens. Their "Know the Signs" programs and practices teach youth and adults to recognize signs and signals of individuals who may be at risk of hurting themselves or others and to intervene to get them help. Over 70% of people who hurt themselves or others tell someone of their plans or give some type of warning or indication. These foreshadowings often show up on social media where their peers see them but are reluctant to tell an adult about them. One reason kids don't tell their parents about another kid's violent plans is because they fear their parents will take their phone away if they know they're on social media that they're not supposed to be. Much like the pass you'll no doubt give your kids if they call you from a party and have no sober way home, this situation warrants a conversation about the relative importance of a life versus a temporary consequence. "Know the Signs" practices have been successful in stopping violence and helping youth receive mental health and wellness assistance. We are exploring the implementation of them in our schools and I hope you will take the time to learn more at here. The discussion of our Board Policy on Observance of Religious Holidays will take place around 5:45 p.m. at Tuesday's Board Meeting. The meeting is held in our District Office, 750 College Avenue, and all are welcome. The complete agenda will be posted by 5:00 p.m. tomorrow on our website. Next Meeting: October 9, 2018 at 5 p.m. in the District Office. The Agenda will be posted by 5 p.m. the Friday before the meeting. Website Tip: Visit our Calendars page to learn how to subscribe to calendars for the entire district, Bacich, Kent, KSPTA so that events will automatically sync with your iCal or Google calendar. I want to take this week’s Parent Bulletin to point out a few important safety features on our campus and celebrate our families and students for adjusting to the changes on our campus due to the construction project. First, thank you to our school families who encourage their children to walk, bicycle, and scooter to and from school. This has made a significant difference in the amount of vehicle traffic that we have experienced this year at Bacich. Car line activity passing through the Sir Francis Drake parking lot has been reduced significantly. The area with increased activity is the crosswalk that extends from the Marin Enrichment building to the Bacich campus. This has become a very busy place of travel. We appreciate everyone who travels slowly and cautiously through this part of campus. To help reduce the traffic flow in this location, we will soon be opening a second crosswalk that will run from the bike path on the south east side of campus, past the construction gate (which will be closed), and onto our campus at the Community Center. Another area that requires additional attention from our school families is the entrance to the kindergarten parking lot located off McAllister Avenue. Please note that traveling from Sir Francis Drake, automobiles may not make a left turn into the kindergarten lot. There is a yellow sign reminding our families of this safety feature while entering our campus. Please remember that anyone visiting our campus to volunteer in classrooms or work in the library or art room, must sign in at the office and get a visitor badge. We must all work together to keep our school safe for our children. Thank you for your support. I am very excited to announce that this month each classroom in our school will read the children’s book, All Are Welcome, by Alexandra Penfold. This is a wonderful book that celebrates inclusiveness and diversity; and reiterates the message to our kids and families that everyone is welcome in our school, in their classes, and the greater community. I chose this book specifically because I feel that it is important to start out the year with the understanding that we are a school that is committed to the inclusion of all people. We value and respect our varied cultural and socioeconomic backgrounds, family structures, and personal attributes. We are a mosaic that is made all the more beautiful by our differences. I encourage you to ask your child about this story and continue the conversation at home. Halloween Parade: October 31, 10:45–11:45 a.m.
We request that our students not bring or wear scary masks of any kind to school on Halloween, and we ask that they not bring any weaponry to school to accompany their costumes on this day. Parents and younger siblings are also asked not to wear masks on our campus during our Halloween celebrations. The annual parade will include all grade levels and all classrooms. The students will gather on the field at 10:40 a.m. and exit our campus to parade through the McAllister Avenue neighborhood. Thursday, November 1, 2018: Technology Parent Information Night, Bacich Library, 6–7 p.m.
Next Meeting: November 1, 2018, 3-4 p.m., Bacich Library. All parents are welcome to attend. Please visit our Site Council page for meeting dates, agendas, and minutes. Please visit our Bacich Families page for information such as the Bell Schedule, Parent Handbook, and other important resources and forms. We have received questions about the lack of activity on our building pad at Bacich in recent weeks. Design specifications regarding the building slab needed clarification and caused the delay. We are back underway now and anticipate no change to our move-in date next summer. This past week we worked to empower Kent students to take action in improving their school, their community, and their world through a variety of Be the Change Week activities. During Be the Change Week, we examined individual journeys of students, staff, and community members, while building empathy for and understanding of diverse life experiences. On Monday, eighth grade student leaders facilitated a full-school assembly rich with stories, songs, and poetry. Select students and staff members shared personal and professional journeys that helped shape their worldview, and perspective, as well as their identity. During advisory on Tuesday and a special advisory session on Thursday, each Kent Falcon reflected on a past or present personal journey of growth, and how that journey has shaped their own identity and view of the world. On Wednesday, all eighth graders worked with their advisories for a full day, intense experience of self-reflection, and community building. 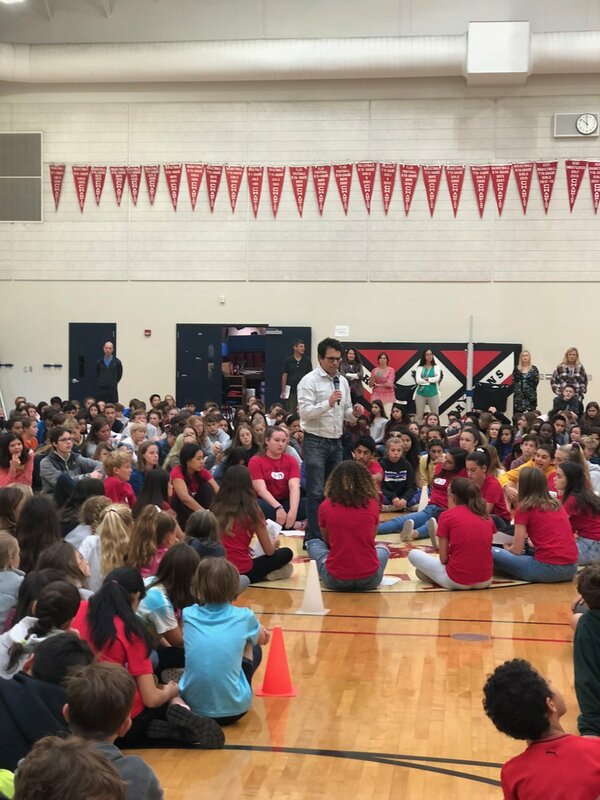 During opportunities class on Wednesday, fifth through seventh graders heard from community speakers sharing diverse stories of personal, professional, and physical journeys. We hope that students concluded this week with a stronger sense of self, a broader world perspective, and an understanding of the power and positive influence they hold. We will revisit this theme of "journey" throughout this year through a variety of activities both inside and outside of the classroom, including our Whole School Read of Alan Gratz’ book, Refugee. I’m proud to be a part of a school community that emphasizes the social and emotional health of our children, and the intentional development of contributive citizens and positive change agents. Be the change you wish to see in the world, Falcons! 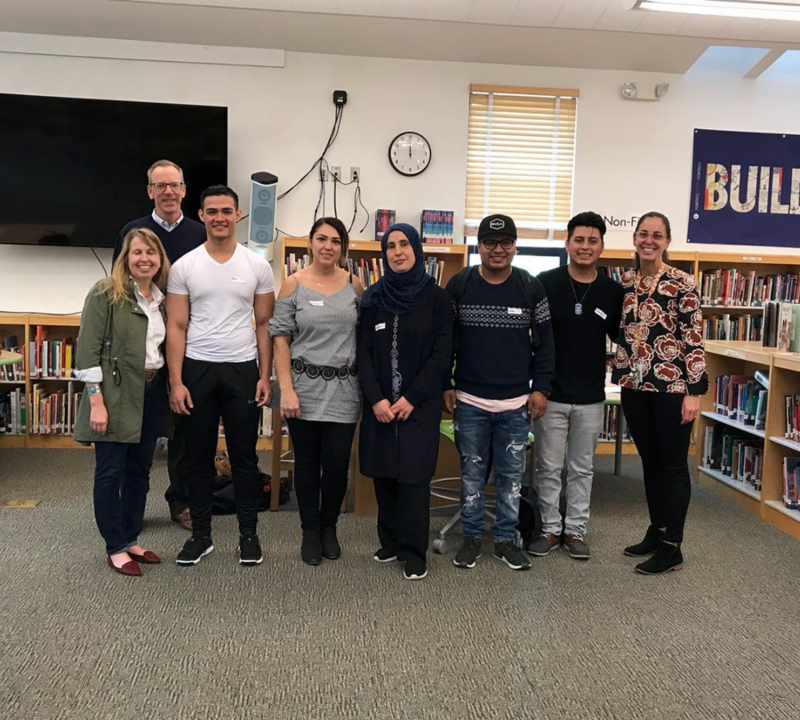 Be the Change Week activities: Assembly (far left and right photos) and College of Marin students (middle photo) visited the Kent Library to talk with students. We are excited to be partnering once again with Good Eggs online grocery to raise money for a Kent Middle School project. This year, our fundraising efforts will be directed toward our One-Book-One-School initiative. If you haven't already heard, we are bringing author Alan Gratz to Kent Middle School this spring. In advance of his visit, our entire school will read his novel, Refugee. In it, Gratz weaves the stories of three different main characters and time periods, and "all three young people will go on harrowing journeys in search of refuge." Our Be the Change week, which begins on Monday, will introduce the theme of journey and that will remain our focus this year in our social and emotional learning curriculum. Our Good Eggs fundraiser began October 1st and ends November 30th. If you haven't used Good Eggs before, I encourage you to check it out and use the new customer discount. If we get 20 new customers to join, Kent will receive a $500 fundraising bonus. Our school's code is FALCONS2018. As always, we remain extremely grateful for our community's support of our school. Hello and welcome to the Counselors’ Corner! The school year had a good and busy start! Middle school is definitely a time that is ripe with opportunities to explore and talk about socially and emotionally related topics! Meeting with individual students and their parents is, of course, a big part of a counselor’s job. We encourage students to take the initiative to sign-up to see us using the counseling box in the main office, as well as outside the Counseling offices. We are also very fortunate to have our fantastic counselor interns, Laura Bolles and Suzanna Brown this year. Laura and Suzanna are here to help us provide consistent and ongoing school-based counseling support for our Kent students. Meetings: We encourage you to contact your child’s teacher directly, if there is a concern or question in a specific class. If you feel there is a need to meet with all of your student’s teachers, feel free to email either Heidi or Corey and we will facilitate putting a meeting on the calendar. These “all-call” meetings are held at 8:00 a.m. in one of our conference rooms. We also meet with the entire school staff by grade level at Guidance meetings, which take place twice per month after school on Wednesdays. Guidance meetings give school staff an opportunity to discuss students about whom we may have concerns or questions. We may also be contacting you to come meet with your child’s team to put together a plan to better support their academic success. 5th Grade: Who Am I and How Do I Organize My Life? 6th Grade: Leaving the Nest - How Do I Advocate for Myself and Others? As most of you know, we have a special protocol for how we deal with bullying at Kent – the Solution Team Approach. For more information, please check out our new Kent Middle School School Counselor website here. Please do inform us if your child is being bullied, even if you do not think a Solution Team is the right fit for your child’s situation - as we would like to assist in making sure that all students feel safe and supported, while at school. Teens in Transition for 8th graders: November 16, 2018 at Kent, November 19-20, 2018 at Branson. If you are choosing to drop your child off in neighborhoods surrounding Kent Middle School, please ensure that your child exits the vehicle on the right hand side and follows all traffic laws like crossing streets in crosswalks. As the driver, please ensure that you are not blocking private driveways and that you follow relevant traffic laws when you re enter the flow of traffic. Thank you for your attention to student safety in the neighborhoods around our school. Please remember that parking is limited on campus and plan accordingly. You may reference this Safe Routes to School Kent Map for parking and park and walk locations. All Kent parents are welcome to attend Site Council meetings. Please visit our Site Council page for meeting dates, agendas, and minutes. Click here for more information about this amazing story, and get your copy today! Please note that all volleyball games are at 3:45 p.m. at Davidson, unless the venue is changed by coaches. Visit our Back to School page for the Parent-Student Handbook and important reminders and forms. The District Resources and Forms page contains all forms and notices for the entire district. Bacich: After walking and rolling to school, stop by the quad for muffins and coffee (coffee for the adults). Kent: All walkers, bikers, skateboarders, and scooter riders will get a small prize and enter a raffle to win a backpack! 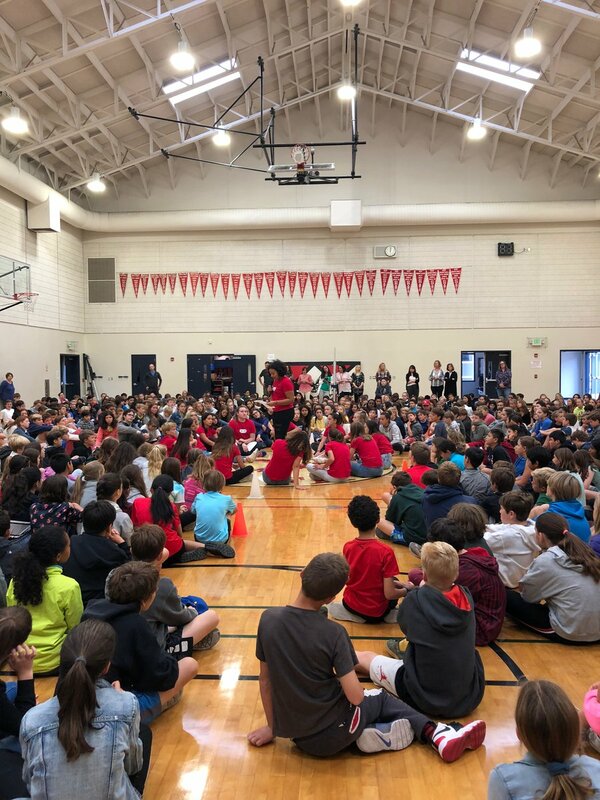 The Kentfield School District encourages all families to actively participate in our nationally-recognized KSD Safe Routes to School Program, a neighborhood-focused initiative to advocate green travel alternatives, and address traffic safety at our schools. A team of Neighborhood Parent Captains provide suggested safe route maps and carpooling options all customized by neighborhood. We also advocate for traffic safety concerns on behalf of the families in our district's neighborhoods. Locate "Safe Routes," "Park and Walk" spots, visitor parking, bike/scooter racks for Bacich and Kent. Note in particular that the designated parking lot for your neighborhood at Bacich. Determine your neighborhood and contacts with our zone map, then visit the neighborhood map for Berens Route Plan, Greenbrae Route Plan, Kent Woodlands Route Plan, Laurel Grove Route Plan, Murray Park Route Plan, and SFD Firehouse Route Plan. Public bus option for middle school students: The Marin Transit Bus 29 has a route designed perfectly for our Kent Middle School students. The bus picks up on SFD and Eliseo at 8:12 a.m. and drops off at College of Marin at 8:17 a.m. It's a short walk to the crosswalk and then to Kent. It costs $1 per child. 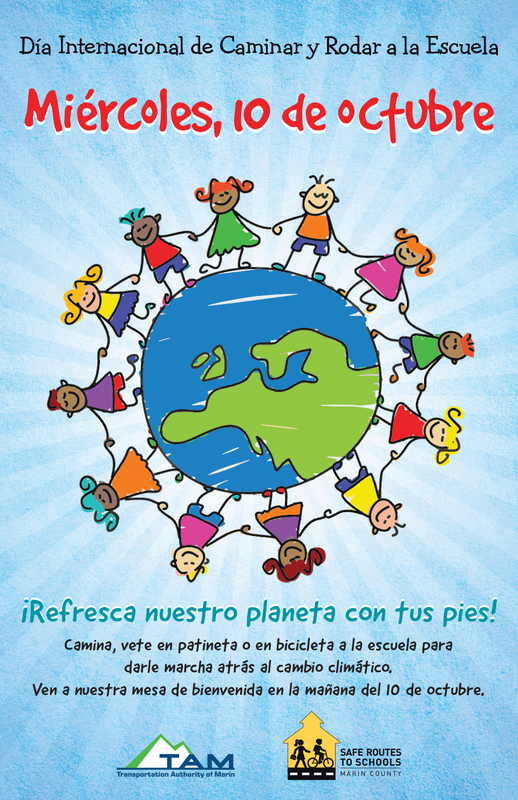 Safe Routes to School Safety tips in English and Spanish. Any contribution at any level makes an impact on our schools. Help us reach 100% participation for our schools. October is when we run our membership drive, so if you haven't renewed for 2018-2019, make sure you head on over to our store, to renew today. And as a special bonus for families, if you renew with two or more memberships (say one for every adult in your house), we will give you a $5.00 Jamba Juice gift card. Isn't that nice of us? 10/25/2018: Parent Ed Event, 7-8:30 p.m. Check out our Parent Education Page for more information or Register Here. KSPTA is pleased to announce the 10th year of the KSPTA Grant Program! KSPTA Grants provide specific funding to enhance and enrich the educational experience of Bacich & Kent students. What does the Grant Program fund? Any KSPTA member: teachers, staff, administrators, parents, or students (along with a parent). If a Grant proposal is submitted on behalf of an entire grade level, every teacher in that grade must be a KSPTA member. To become a KSPTA member, please visit the KSPTA Online Store. The grant application deadline is Tuesday, October 9, 2018, 4:00 p.m.
October 25, 2018, 7-8:30 p.m. These programs are not sponsored by the Kentfield School District. Distributing flyers and information is a community service and does not imply endorsement. Join Marin County’s Art and Culture Master Planning Process! Mark your calendars for the District 2 Community Arts Planning Forum with Supervisor Katie Rice on Thursday, Oct 11, 2018. The Marin County Department of Cultural Services, in partnership with the Marin Cultural Association, the Marin Coalition for the Arts, and arts leaders from all over the County, is developing an arts and culture master plan for Marin. The plan is intended to strengthen existing arts, cultural and creative resources for residents, artist and organizations and define a roadmap for the creative future of Marin. The planning team needs to hear what your vision is for Marin’s creative future – for you, your family, and your community. Saturday, October 11, 6-7:30 p.m. If you can’t make the meeting, please consider attending one of the other meetings held throughout the County or share your thoughts by completing the Marin Arts Culture Action! Community Survey. The Portland Theatre Company is presenting the play No Belles, a play that focuses on the lives of women scientists who won Nobel Prizes, and some who did not. The Women Chemists Committee have arranged for this production to be shown in the Bay Area to benefit and inspire young women STEM students, in particular, but also to be accessible to all students aspiring to become a scientist. Following the play will be a networking event that allows students to meet Bay Area scientists to learn about their careers. There are three ways to register – but please refer to the flyer for specific instructions. Join us, and invite a friend for one or perhaps all three Saturdays, October 13, 20, and 27, 2018. Join Bacich art teacher Barbara Libby-Steinmann and Kent parent and artist Anna Rochester, as they guide you through three different hands on activities: Coffee Stain Painting, Wrangle the Wires Sculpture, and Veggie Patterned Tea-Towels. Engage in art lessons that you can do with your kids in your own home. Find ways to support your kids exploring different materials to express themselves in the arts. And best of all, it is fun and free! Download the flyer and register here. In September, the U.S. Food and Drug Administration announced that vaping among teens has reached “epidemic proportions.” Locally, the California Healthy Kids Survey results show that vaping use among Marin teens more than doubled in the past two years. This alarming data is a call to action for parents, public health officials, educators, and concerned community members. The Marin County Office of Education, Marin County Health and Human Services, and the San Francisco Marin Medical Society are hosting Vaping Epidemic – A Parent and Community Education Workshop at 6:30 p.m. on October 18th. This workshop will provide information about e-cigarettes and vaping, risks associated with use, and prevention strategies. More information available here in English and Spanish. Wednesday, October 24, 7- 8:30 p.m. In this participatory workshop, parents, caregivers, educators, and students in middle school or older, will learn about the types of cyberbullying as well as the academic and social impacts of this behavior. Participants will learn strategies to address and prevent cyberbullying. Registration is not required, but seating is limited. Download flyer. On behalf of the Kentfield-Greenbrae Historical Society, please join us for our annual Members Meeting. The enthusiasm generated at the Community Heritage and History Day for our local history has encouraged us to bring back the Dewey and Richard Show for our fall member's meeting. These two local historians have been instrumental in preserving and recording the history of Kentfield and Greenbrae. They will narrate a revised slide presentation of the Heart of Marin. Dewey Livingston is the author of our book "In the Heart of Marin: A History of Kentfield and Greenbrae", published in 2014 at the time of the Kent Centennial.